It grows louder, and is joined by another and another. The beating builds, thumping until the ground shakes, and the trees sway with the rhythm. I am in the fabled Teutoburg Forest in Germany. Strange…drums in the middle of this secluded woodland? The sound is too rich, too real, to be a cell phone ringtone from another hiker. They rise in front of me, a line of giants towering above the tops of the ancient oaks and fir trees. They are the Externsteine, a natural rock formation of thirteen massive stone pillars. Some are more than than twenty times my height—megaliths created by the gods. Little is known for sure of the Externsteine’s history, but what intrigues me the most aren’t the facts but the unknown. 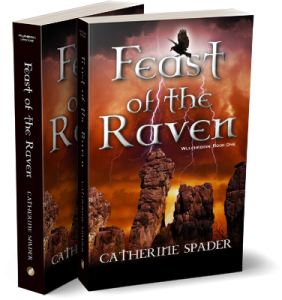 For me, it was destiny that this mysterious place became the pivotal setting of my novel, Feast of the Raven. I have to smile now when I think of Charlemagne. 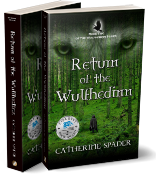 He would be dismayed to know that after more than thirty years of war to eradicate paganism, it is alive and well today at the Externsteine. Some modern neo-pagans consider it sacred and gather here every year to celebrate the summer solstice. It’s easy to understand the draw this place has for spiritual people of many faiths. I am glad that there is so much mystery surrounding this place of wonder and legend. History and fact are important, but stories thrive when unburdened by too much data and research. I want to visit there, now! Your description is too evocative and haunting not to inspire me to seek out those untold myths and stories myself. It is amazing! 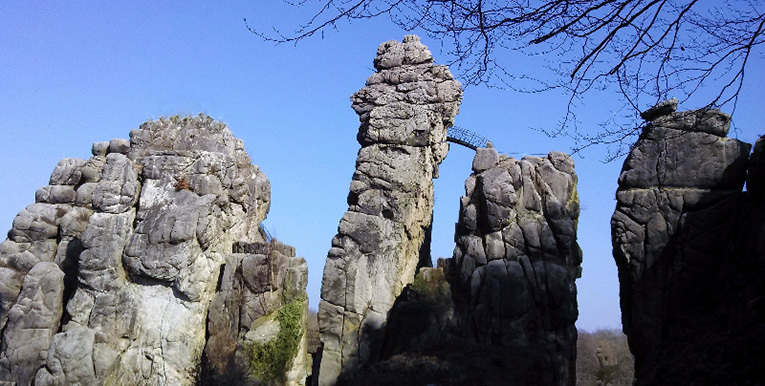 There are so many fascinating things to experience at the Externsteine–history, geology, religion, spirituality, nautre. The surrounding Teutoburg Forest is a quintessential misty, mossy, fairy tale forest. A wonderful hiking trail, called the Hermannsweg Trail, runs through the forest connecting the Externsteine with castles and other historic sites. So glad I got to experience the area with you. I can understand the appeal it had for you. I’m sure you remember climbing up the rocks and viewing the countryside. An inspiration point. I will never forget it! A great day!